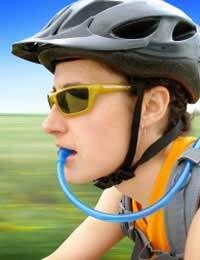 Mountain bike equipment is just as important as mountain bike clothing. It's always tempting to want to travel light, but you'll be glad of the equipment if you run into difficulties in an area where this is no immediate assistance available. This article offers advice on choosing mountain bike equipment. For safety reasons, you should never ride a mountain bike without wearing a helmet. The best types of helmet are made from expanded foam polystyrene and are covered with a protective plastic outer surface. The most important thing to consider is the fit. When the chin strap is fastened, you should not be able to move the helmet forwards or backwards. This usually means that it is too big, and could fall off. Ventilation is another consideration. Most specialist bike helmets have plenty of scope for ventilation, with multiple air channels stretching from the front of the helmet to the back. If you are going to be doing downhill mountain biking, a helmet that protects as much of your face as possible is advisable. If you are going to be mountain biking in the sun, glasses are an essential piece of mountain biking equipment. They protect your eyes from the damaging rays of the sun. They also protect your eyes from dust, dirt and insects in windy conditions. The typical mountain biking trail is likely to throw up lots of these. A backpack is useful for storing mountain biking equipment that you need to take with you but have no room for elsewhere. Some types of backpack have mesh lining to help with circulation and general stability. Look for one with a hip belt, as you can't guarantee that shoulder straps alone will be enough to keep the backpack attached to you. Although many of the essential bike parts needed to help repair damage to your bike (see the following paragraph for a list of the bare minimum that will often prove useful) are intended to be lightweight enough to fit underneath the bike seat, it is often much easier to keep them in a backpack instead. Given the physical nature of mountain biking, they can easily come loose. A first aid kit is an essential piece of mountain biking equipment, and should be kept in your backpack at all times. As a bare minimum, your first aid kit should contain bandages, antiseptic cream, plasters and tweezers, and should be restocked as and when items are used up. A waterproof storage container is the ideal home for these items.